At age six, when Jens (Yens) heard the banjo on one of his dad’s American records, he yearned to play it. But having no access to one, Jens played their mother’s accordion, accompanying Uwe, who played their father’s guitar. When Jens turned ten he acquired a tenor banjo and started to play Dixieland jazz, hoping that one-day ‘Foggy Mountain Breakdown’ would somehow flow from the instrument. A year later, Jens and Uwe made their first public appearance, and two years later Uwe bought Jens his first five-string banjo. At age 16, Jens and Uwe left home and traveled throughout Europe calling themselves the Rocky Road Band, attempting a living as street musicians. Their adventure paid off in the form of a record contract with CBS. In 1982, at the age of 20, Jens crossed the Atlantic, heading for the Bean Blossom Festival and Bill Monroe. 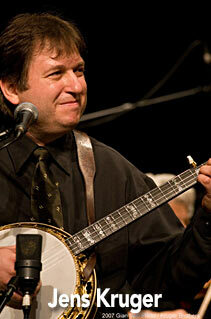 Munroe introduced Jens to the Grand Ole Opry, as the first known European banjo player. After living with Bill for the summer and following his advice, Jens returned to Switzerland to develop his own musical style and repertoire. For four years, Jens spent days and nights learning tunes from all the records he could find. In 1986, Jens and Uwe reunited to form the Appalachian Barn Orchestra, the forerunner of today’s Kruger Brothers. Since MerleFest 1997, the event that launched the Kruger Brothers’ career in America, Jens has performed with Earl Scruggs, Doc Watson, John McEwen, Willie Nelson, and Ricky Skaggs, to name only a few. Like Uwe, Jens can play many stringed instruments with proficiency, and like the Kruger Brothers, Jens’ style and virtuosity cannot be characterized with a word or phrase. But those who have heard Jens play banjo know that he is truly a master of his art. As a composer, Jens’ comprehension of music in all of its forms is becoming well known among his peers, colleagues, and the Kruger Brothers’ growing audiences.